The Office of General Education and Innovative Electronic Learning has conducted GE courses, aiming to achieving learning outcome according to the paradigm – to fulfill the humanity. The model of learning-teaching always concentrates on opening students’ vision in terms of perspectives towards the world and how tow to perform a happy life. Each course can be applied in real life, in particular, as a good citizen of the society and the country. Additionally, the instruction will be continuously adjusted, aiming to gain effective outcome achievement. 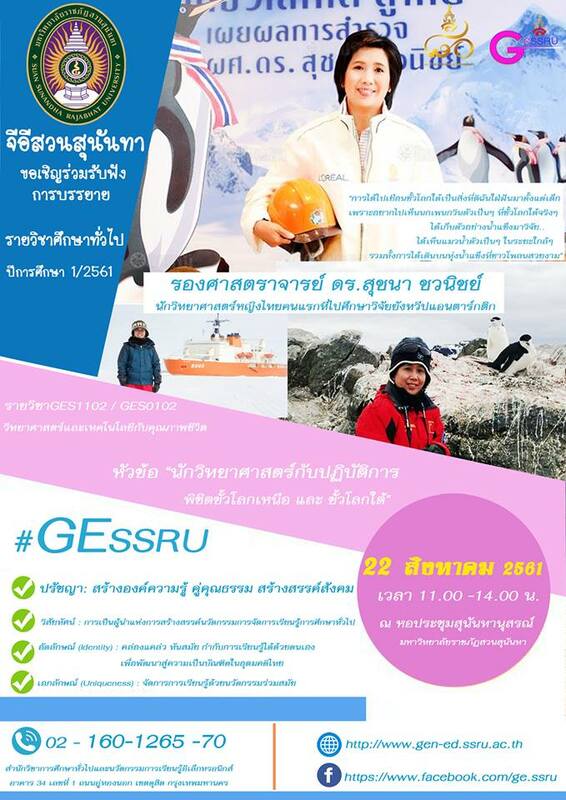 On this occasion, the office wishes to invite all staff members and students to join the lectures presented by experts and well-known guest speakers at Sunandhanusorn Audutorium, Suan Sunandha Alumni Building, and Room 4701, Faculty of Industrial Technology, from 8.00 onwards, free of charge.